Sage Installations are based in Whitstable nr Canterbury and have served Kent and the South East of England efficiently and professionally since 2008. We supply and install quality double glazing windows, doors, conservatories, aluminium windows, garage conversions and fascias/soffits. We provide an easy stress free and cost effective installation of top quality products that will be an asset and investment for every home. Sage Installations are fully certified, experienced and trust worthy. 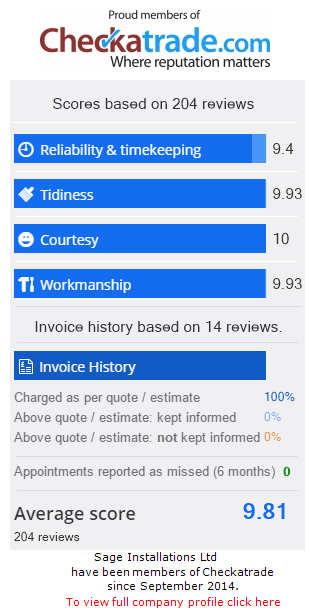 The majority of our work is referred to us by happy customers and we are sure to handle all jobs professionally and to the highest standard. Please see our testimonials and Check A Trader ratings. We are Eurocell approved Window Installers using Eurocell window profile for our window installations which can also be fitted with triple glazing. We are also a member of The Buy With Confidence scheme which is run by the trading standards giving customers total peace of mind knowing we have been vetted and recommended by the trading standards and Eurocell Window Systems if you are thinking of replacing those draughty old windows or upgrading your old double glazing to the very latest A rated energy efficient windows or building that dream conservatory phone 01227 219462 to arrange your free site survey and trouble free installation. Approved Guardian Conservatory Roof installation which offers contemporary or traditional finish internally. Choose from a plaster finish or timber/PVC-u cladding, with optional Fakro roof windows. Externally choose from a selection of attractive roof tiles best suited to your home. The options are endless, helping you to produce your own beautiful and unique living space. To deliver a premium product at a competitive price. To complete works on time. If your home needs some TLC please contact us today we are always happy to help. With thousands of successful installations since 2008,you can trust the Sage 10-Year Guarantee, which covers all parts, materials and workmanship. You will also receive an Insurance Backed Guarantee and Deposit Protection for extra peace of mind. Sage’s manufacturing partner has invested over £2 million in their manufacturing plant, enabling us to work to the most exact specifications and standards every time. Certass provides you with the Building Regulation Compliance Certificate for the work carried out. Secured by Design is the official Police-preferred high security specification for windows and doors. from their customers put online for all to see. To become a Pilkington energiKare partner, Pilkington have checked Sage’s credentials with regards to Window Energy Ratings and installation proficiency. As an approved supplier of certified Energy Rated Windows & Doors, Sage exclusively uses U-Comply, which proves compliance and this is audited by Certass, Fensa and the British Standards Institute.